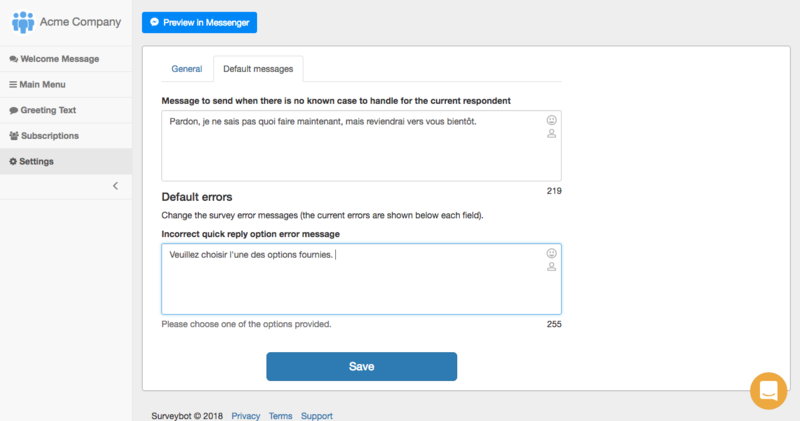 Does Surveybot support multiple languages? 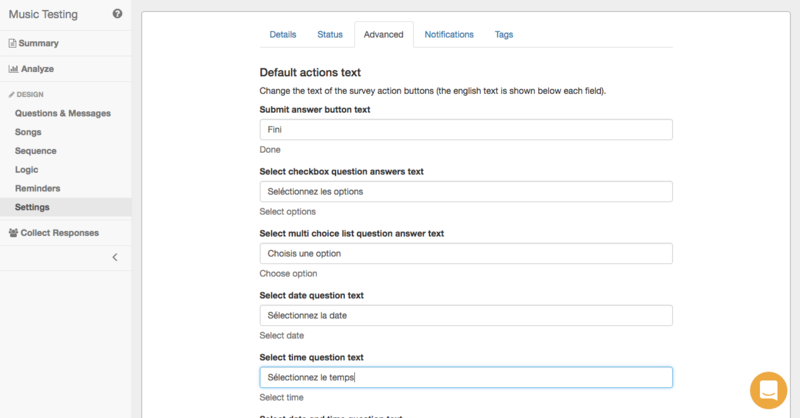 How to change your language presets so you can use any language with Surveybot. 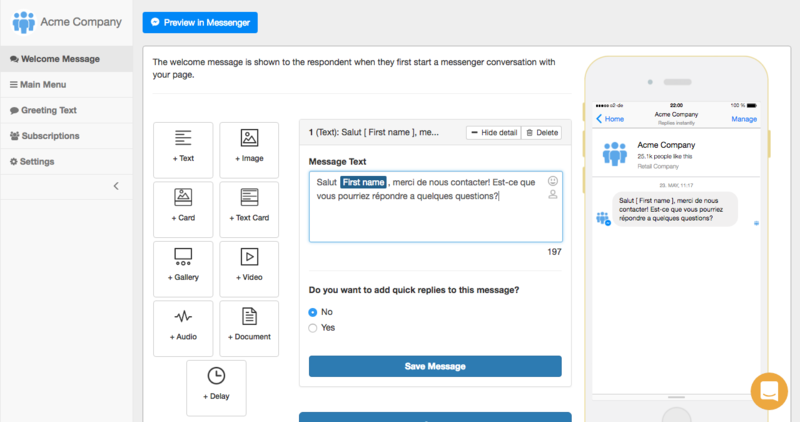 Surveybot does support all languages! You can enter text in whatever language you choose in your surveys. Beyond that, all it takes is a little more effort on your part to make sure all the buttons, default messages and error messages are translated into your chosen language. You can either watch the video below, or read the article, both of which will take you through this process step-by-step. To begin, go into the design tab for a particular survey. Then click 'Settings' on the sidebar and select 'Advanced'. This will give you a list of all the default action buttons, such as 'Done' for submitting an answer. It will look like the below image, with fields for you to fill in translations of the text for the buttons in your chosen language. Above the fields there are descriptions of what the buttons do, and below are what the text for the buttons are in English. For the purposes of this article, I have translated all the fields into French. Once you have finished with the default actions, if you keep scrolling down the same page you will come to default messages, which also need to be changed into your chosen language. 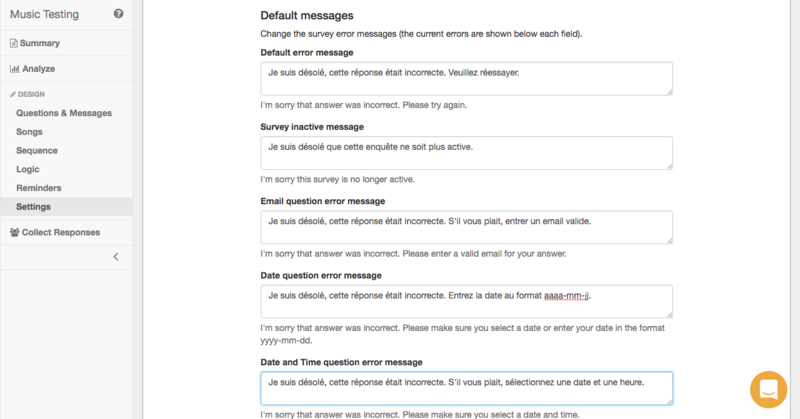 These are error messages for where a respondent enters an invalid answer as it is in the wrong format for instance. This will look like the below image, and the process for changing these is the same as for default actions above. You then need to click the blue 'Save' button at the bottom of the page. The next changes you need to make are in the 'Bots' tab. Once you select the specific bot you want to make changes to, start with the 'Welcome Message' tab on the sidebar. This is the message that will come up when people first interact with your page, and usually says something like 'Hi there, thanks for getting in touch with us. Would you mind answering a few questions?'. 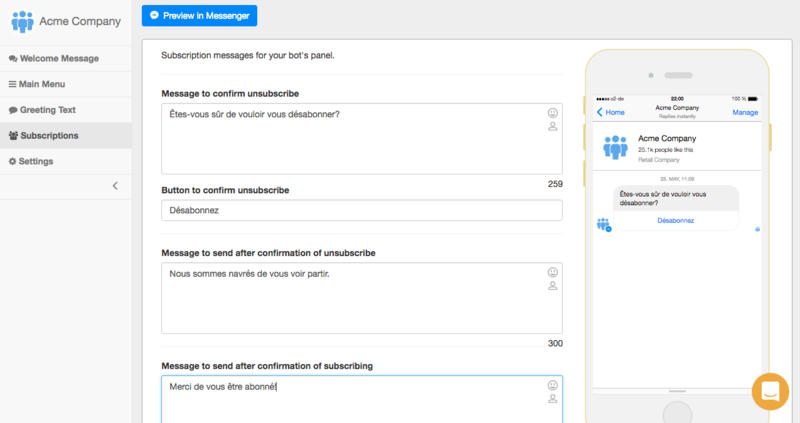 You can change this in the text field to say whatever you'd like in your chosen language. Once you have saved this, move on to the 'Main Menu' tab. This is an optional way to have a button that is always present on your respondents' screens when their conversation with you is open, and it's often useful for creating a link to your website. 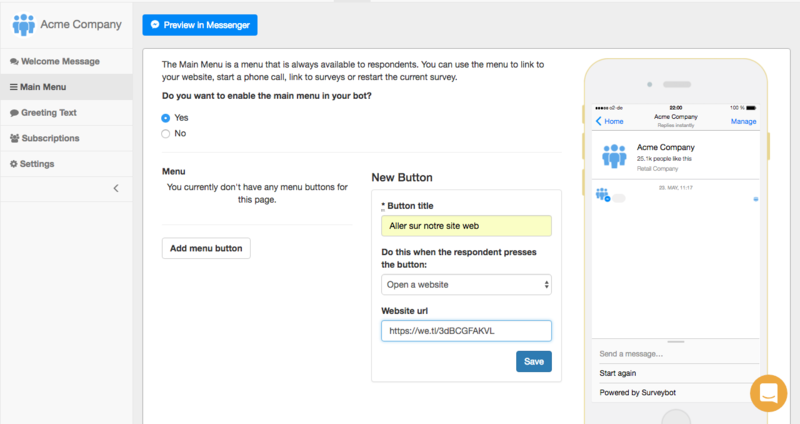 To do this, you just select 'Add menu button', choose the function of the button and type the text in the top field. You can see how this looks in the below image, where I am adding a button to link to a website. Next, select the 'Greeting Text' tab. 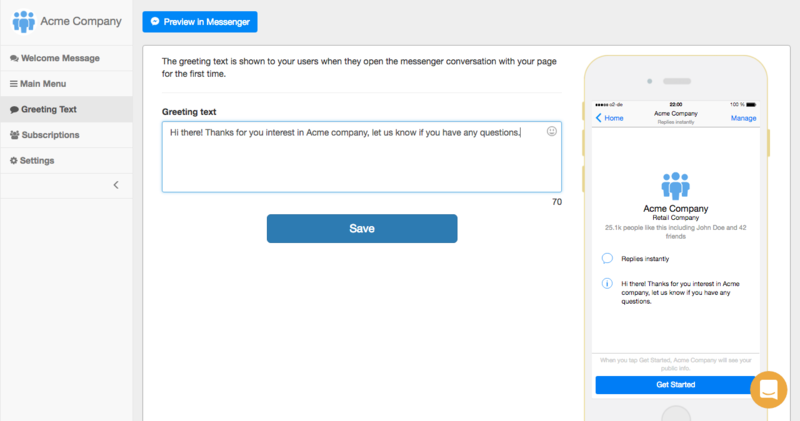 This is an optional greeting that will pop up as part of your page information in the pop-up window when someone first selects the button to message your page. These usually say something like 'Hi there! Thanks for your interest in Acme Company, please let us know if you have any questions.' All you need to do is enter the text you want in your chosen language into the text field, which will look something like the below. Next, you will need to select the 'Subscriptions' tab. Here, you have to add a message to allow your respondents to unsubscribe from your panels, which might say something like 'Do you want to unsubscribe from our surveys?'. You then create the text for the button that allows them to do this, saying something like 'Unsubscribe'. There are a couple of other fields to fill in here as well. This will look something like the image below. Finally, select 'Settings' in the sidebar, and then click on the 'Default messages' tab. The first message is for when the bot is unsure what to do, and will usually say something like 'Sorry, I'm not quite sure about that but I will get back to you soon.' The second one is for an error where the survey requires them to select a response, and they type out a response instead. Once you've followed these steps, your bot will be ready to go in whatever language you choose! If you need any help with this or anything else, feel free to contact us at support@surveybot.io. For a quick visual walkthrough of these steps, check out our video below. Keywords: Spanish, French, German, Chinese, Mandarin, Cantonese, Japanese, Italian, Portuguese, Thai, Cambodian, Russian.